Home » History Quiz , India GK , Maharashtra GK » Who was the 'Political Guru' of Mahatma Gandhi ? Who was the 'Political Guru' of Mahatma Gandhi ? Q. Who among the following was the 'Political Guru' of Mahatma Gandhi ? Ans: B ( Gopal Krishna Gokhale(9 May 1866 – 19 February 1915) was one of the founding social and political leaders during the Indian Independence Movement against the British Empire in India. Gokhale was famously a mentor to Mahatma Gandhi in his formative years. In 1912, Gokhale visited South Africa at Gandhi's invitation. As a young barrister, Gandhi returned from his struggles against the Empire in South Africa and received personal guidance from Gokhale, including a knowledge and understanding of India and the issues confronting common Indians. 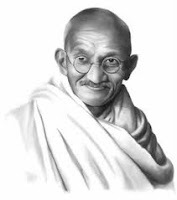 By 1920, Gandhi emerged as the leader of the Indian Independence Movement. In his autobiography, Gandhi calls Gokhale his mentor and guide. Name of person shown in Picture is ? Name the Person in Picture ? Absolute Zero temperature is ? Number of Chambers in Human heart is ? Who build Vijay Stambha in Chittorgarh ? Who brought Ashoka Pillar to Delhi ? Founder of Harijan Sewak Sangh ? Operation Menu is associated with ? ASEAN–India Commemorative Summit 2012 held in ? Structural Planning refer to ? Process of production of energy in Sun ? Name the place shown in Picture ? Cholas had their capital at ? First woman Chief of African Union is ? Tutor of Alexander the great was ? Indraprastha is Former name of which city ? Busiest Airport of India is ? Battle of Plassey was fought in year ? Largest copper producing country in World is ? Winner of Duleep Trophy 2012 is ? The City of Nawabs is ? VOLTA River project is located in ? Gobi Desert is located in ?